Please read this post before you update to WooCommerce 2.1 right away. As always, there are a couple steps you’ll need to take before it’s safe to update your live website. Your website is probably making you money, so you’ll wanna take a couple extra steps before updating to know that you’re not running into any trouble with this new version. 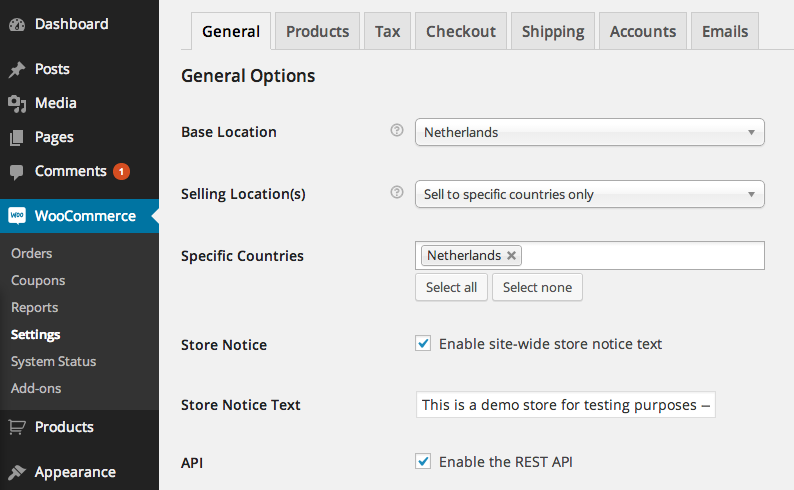 Before you update your live website to WooCommerce 2.1, please use a test environment for all your testing. You can use the test environment as a sandbox to simulate the update and make sure your website will continue to work after you update it to WooCommerce 2.1. Also make sure that you have updated all your premium WooCommerce extensions to the latest available versions, as they have all been made compatible in the last two months. WordPress 3.8 is required for WooCommerce 2.1 to run, so please update to the latest stable version of WordPress. This not only gives you all the new features in the new WordPress version, but also ensures your website is on the safest release of WordPress to date. So what’s new in WooCommerce 2.1? REST API and a lot of under the hood improvements to make WooCommerce faster. The REST API offers you a way to open your data to external tools, in a secure way. The API offers authenticated access to a webshops orders for example. The administration panel got a fresh new look, making it blend in with the new WordPress 3.8 UI. We’ve also improved a couple screens, specifically the order management screens, making them much easier to work with. You can read more about these changes in an earlier post. The reporting tools have been improved, we have enhanced the way you can filter the data in the reports and added the ability to export CSV files from them. Default templates are now responsive, so they blend in even better with any theme. If your theme is responsive, so are the WooCommerce templates by default from now on. You can read the full details of these changes in our earlier post on all the changes in WooCommerce 2.1. With the new visual updates coming from the new WordPress 3.8 administration panel UI, we’ve taken the opportunity to improve our own administration panels too. The first thing you’ll notice is that the tabs in our settings screens have changed. An overview of the new settings panels and new tab layout, in the new WordPress 3.8 administration panel UI. Settings for products and the inventory settings are now in a single ‘Products’ tab. Payment gateways and checkout options, can now be found in the ‘Checkout’ tab. The settings around user accounts and the corresponding pages have been grouped together in the ‘Accounts’ tab, making them real easy to find. All of these changes have been made to make day to day operations in the administration panel more intuitive and make the settings easier to find. WooCommerce 2.1 is a real big update. If you think you’ve found a bug, please report it back to us. Although we have been doing extensive testing on this new version before releasing it, it’s always possible that we’ve missed something. IMPORTANT: Before you post anything, please check our list of common issues after updating to WooCommerce 2.1. This is a continuously updated list of issues that are occurring for multiple people and include quick workarounds or solutions. These issues can be solved by yourself, without having to contact our or third party developers support. Enjoy the new WooCommerce release! I hope you will enjoy everything coming in WooCommerce 2.1. It’s packed with a lot of new stuff, improvements and bug fixes. This is the next big step where we’re building on top of the new WooCommerce 2.0 foundation. With our new release schedule, these amazing releases will come more frequent as well. 2014 is going to be an exciting year for WooCommerce again. Finally, I’d like to thank all our contributors, who have done an amazing job in helping us with bug reports, fixes and some contributed new functionality as well. Besides code contributions, we also have a growing pool of people translating the plugin in their own languages. We couldn’t make WooCommerce without you guys! Previous post: Hello WooCommerce 2.0!